We purchased this Infinity Three Wheeled Mobility Scooter on CraigsList but found that the Infinity electric wheelchair is not big enough for a 200 pound man to ride and operate comfortably. The wheelchair would be fine for a smaller man or a woman. We bought a new battery and found that it works fine. It doesn't roll fast, but it works fine and is probably best for indoor use. Go here to see more. Ebay Partner Network. Check out the used and new mobility scooters with three wheels and you will see that mine is priced very reasonably with a new one selling for approx. double my price. The measurements are 39 inches by 18 1/2 inches. can be transported in the back of a compact hatchback. The parts for this nice used Infinity Mobility scooter are fairly heavy. 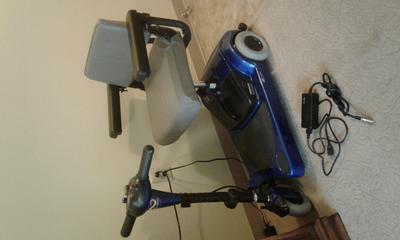 The used mobility scooter chair for sale is in Kansas City, MO Missouri. Email me regarding the Infinity in this classified ad using the comment form below provided by GoGoCycles Used Motorcycles for Sale.